Therapy Laser Has Arrived At LMAH! For many years, world-class athletes and thoroughbred race horses have benefitted from laser therapy treatments. Fortunately, this technology is now available for pets. Laser therapy also reduces inflammation by increasing vasodilation, activating the lymphatic drainage system, and reducing pro-inflammatory mediators. As a result, inflammation, erythema, bruising, and edema are all reduced when treated with laser. This is especially important for conditions where anti-inflammatory medications are risky for the patient because of the patient’s age, liver health, or species. 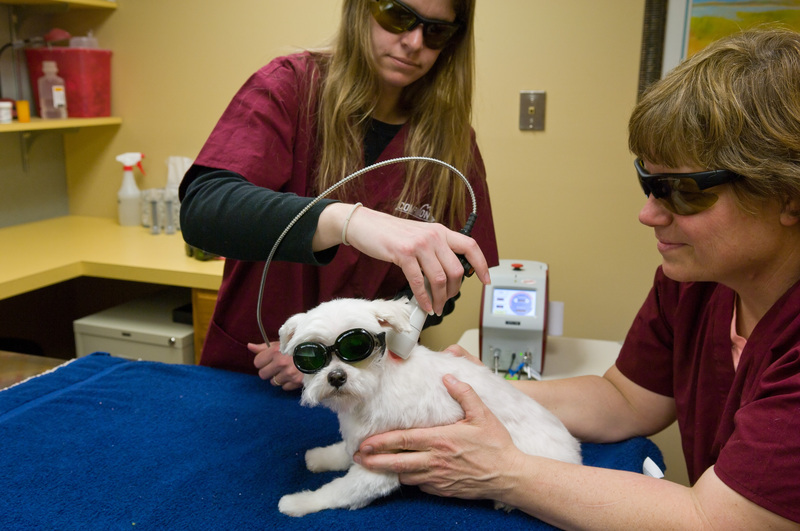 Laser therapy is a drug-free treatment modality that can often replace or enhance other treatment plans recommended by your veterinarian. A benefit of the more modern, higher-powered therapeutic lasers, like the Companion Therapy Laser, is that adequate dosages of laser energy, or photons, can be painlessly and efficiently delivered to deeper tissues. This is a huge benefit in treating chronic conditions such as arthritis, hip dysplasia, back disease or injury, and degenerative joint diseases. Geriatric patients often suffer from one or more of these painful problems, as well the aches and pains that come naturally with aging. There thousands of reports of pets who were lame an inactive who return to normal, or almost normal function after laser therapy. More chronic and more severe cases may require multiple treatment sessions to fully benefit. We always had pets growing up, but I honestly could not tell you where a nearby veterinarian was. I’m sure my parents never vaccinated their dogs, much less worried about preventative care. My parents were great care givers and loved our animals, but I think it was the old school attitude that you only saw the vet to euthanize your dog. As a young adult I adopted the same philosophy as my parents. As we started introducing pets into our household with children I choose to become more educated on the benefits of regular veterinary care. It wasn’t until I began working at an animal hospital that I let myself believe in the value of preventative care and saw for myself the benefits and unfortunately the downside of lack of care. I also never thought about the financial benefit of prevenative care until we had our first doggie dental that required multiple extractions, our pocketbook was not happy! Zoom ahead to 2014 and I am much more proactive about having annual exams, vaccines, wellness checks and especially dentals. I know how icky I feel when my mouth is not clean, I have a cavity or worse, I can only imagine how our little four legged friends must feel. The noticeable benefit is when they pant in my face and I don’t want to drop over from the smell, the hidden benefit is knowning I have done what I can to help extend their life and address any found issues. In celebration of national pet dental month we want to share a informative webpage with quick videos and information on preventative care and periodontal disease, https://www.avma.org/Events/pethealth/Pages/February-is-National-Pet-Dental-Health-Month.aspx. We also will be celebrating dental month with a great affordable dental cleaning special. Why not give our staff a call for me details.